Nadezhda Konstantinovna "Nadya" Krupskaya (Russian: Надежда Константиновна Крупская, scientific transliteration Nadežda Konstantinovna Krupskaja) (26 February [O.S. 14 February] 1869 - February 27, 1939) was a Russian Bolshevik revolutionary. She was the daughter of a Military officer. She married the Russian revolutionary leader Vladimir Lenin in 1898. Krupskaya became a convert to Marxism at a young age and met Lenin as a result of her revolutionary activity. She followed him into exile, first in Siberia and later into Switzerland where they joined the emigre community of revolutionaries working for the end of autocracy in Russia. She returned with Lenin at the end of the First World War when the autocracy collapsed and Tsar Nicholas abdicated. Although she initially questioned Lenin's strategy, after the Bolshevik seizure of power, she supported the new regime, surviving the death of her husband in 1924, and subsequent imposition of Stalinism. She is credited with helping develop the Soviet library system. Nadya’s father, Konstantin Ignat’evich Krupsky, was orphaned in 1847 at nine years of age. He was educated and given a commission as an infantry officer in the Russian Army. Just before leaving for his assignment in Poland he married Nadya’s mother. After six years of service, Krupsky lost favor with his supervisors and was charged with “un-Russian activities.” He may have been suspected of being involved with revolutionaries. Following this time he worked in factories or wherever he could find work until later in life when he was recommissioned just before his death. Her mother, Elizaveta Vasilyevna Tistrova was the daughter of landless nobles. Elizaveta’s parents died when she was young and she was enrolled in The Pavlovskoy Institute, which happened to be the highest formal education available to women in Russia during this time. After earning her degree Elizaveta went on to work as a governess for noble families until she married Krupsky. One of Nadya’s friends from gymnasium, Ariadne Tyrkova, described Krupskaya as “a tall, shy, quiet girl, who did not flirt with the boys, moved and thought with deliberation, and had already formed strong convictions… She was one of those who are forever committed, once they have been possessed by their thoughts and feelings….” Nadya attempted to attend two different secondary schools before finding the perfect fit with Prince A.A. Obolensky Female Gymnasium “a distinguished private girls’ secondary school in Petersburg.” This education was probably more liberal than most other gymnasiums since it was noted that some of the staff were former revolutionaries. After her father’s death Krupskaya and her mother gave lessons as a source of income. This probably didn’t bother Krupskaya since she had expressed an interest in entering the education field from a young age. She was particularly drawn to Leo Tolstoy’s theories on education, which was fluid instead of structured. They focused on the personal development of each individual student and centered on the importance of the teacher-student relationship. This led Krupskaya to study many of Tolstoy’s works, including his theories of reformation. These were peaceful, and law abiding ideologies, which focused on people abstaining from unneeded luxuries and self-dependent instead of hiring someone else to tend your house, etc. Tolstoy had a lasting impression on Krupskaya, since it was said she had “a special contempt for stylish clothes and comfort.” She was always modest in dress as were her furnishings in her home and office. As a devoted, lifelong student, Krupskaya began to participate in several discussion circles. These groups got together to study and discuss particular topics for the benefit of everyone involved. It was later, in one of these circles that Krupskaya was first introduced to the theories of Marx. This piqued her interest as a potential way of making life better for her people. Krupskaya began an in-depth study of the subject. This was difficult since such books had been banned by the Imperial Russian government. Consequently, revolutionaries had been collecting such books and keeping them in underground libraries. It was at a similar discussion circle that Krupskaya first met Vladimir Ilyich Ulyanov, a devout Marxist who later came to be called Lenin. Krupskaya was impressed by his speeches, but not by his personality, at least not at first. Lenin was often described as flawless or even God-like by many of his later followers. It is hard to know very much of the courtship between Lenin and Krupskaya as neither party spoke often of personal matters. 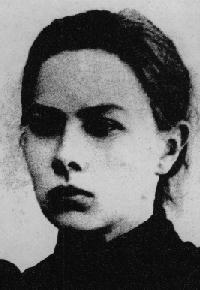 In October 1896, several months after Lenin was arrested, Krupskaya was also arrested. After some time Lenin was sentenced to exile in Siberia. They had very little communication while in prison but before leaving for Siberia, Lenin wrote a “secret note” to Krupskaya which was delivered by her mother. It suggested that she could be permitted to join him in Siberia as his if she told people she was his fiancée. At that time Krupskaya was still awaiting sentencing in Siberia. Krupskaya was permitted to accompany Lenin, but only under the stipulation that they were to be married as soon as she arrived. Whether she married for love or for the cause is unknown. Upon his release Lenin went off to Europe where Krupskaya met up with him upon her release. They spent time in Geneva where with a group of revolutionary Russian expatriots that included George Plekhanov, Pavel Axelrod and other members of the Liberation of Labour. It is there that they decided to publish a newspaper that would help to galvanize the revolutionary cause, Искра (Iskra), Russian for "Spark." "The paper was named after a passage from a poem: 'The spark will kindle a flame'. Others who joined the venture included Gregory Zinoviev, Leon Trotsky and Vera Zasulich. Another revolutionary, Clara Zetkin, arranged for Iskra to be printed in Leipzig, Germany." She and Lenin remained in neutral Switzerland through the First World War, returning to Russia after Russia's defeat and the collapse of the autocracy. Originally not a proponent of Lenin's calls for a revolutionary overthrow of the Provisional Government, but after the successful coup d'etat and Bolshevik assumption of power, she supported her husband's decision. Krupskaya's political life was active: some would put her in the same category as Alexandra Kollontai. She was a functionary of the Bolshevik faction of the RSDLP from the early days. After the October Revolution, she was appointed deputy to Anatoly Lunacharsky, the People's Commissar for Education. She was also fundamental in the development of Soviet librarianship. Her relationship with Lenin was more professional than marital—which Kollontai compared to slavery—but she remained loyal, never once considering divorce. Krupskaya is believed to have suffered from Graves' disease, an illness affecting the thyroid gland in the neck which causes the eyes to bulge and the neck to tighten. In female sufferers it can also disrupt the menstrual cycle, which may explain why Lenin and Krupskaya never had children (and the rumors about Lenin allegedly choosing to have an affair with Inessa Armand). As a result of her disease she was codenamed 'Fish' inside the Party, and Lenin allegedly used to call her "my little herring." "Comrade Lenin may be in need of a new widow." However, unlike Stalin’s other rivals inside Russia, Krupskaya was not arrested during the Great Purges. "N.K. Krupskaya died on February 27, 1939. Her ashes lie in the Kremlin wall next to the Lenin Mausoleum in Red Square in Moscow." Before Krupskaya’s arrest she worked five years as an instructor for a factory owner who offered evening classes for his employees. Legally, reading, writing and arithmetic were taught. Illegally, classes with a revolutionary influence were taught for those students who might be ready for them. Krupskaya and other instructors were relieved of duty when nearly 30,000 factory workers in the area went on strike for better wages. Even after the revolution her emphasis was on “the problems of youth organization and education.” In order to educate they needed better access to books and materials. Before the revolution Russian libraries had a tendency to exclude particular members of society. Some were exclusively for higher classes and some were only for employees of a particular company called Trade Unions. In addition to their exclusive nature they also had narrow, Orthodox literature. It was hard to find any books with new ideas, which is exactly why the underground libraries began. Another problem was that many people did not know how to use libraries and even more people were illiterate. The revolution did not cause an overnight improvement in the libraries. In fact, for a while there were even more problems. The Trade Unions opened up their doors to family members of employees, but refused to open their doors to the general public. As could be expected, funds for purchasing books and materials were short during the change, however it was not expected that there would be no new books to purchase. The books that were already a part of the libraries were falling apart. In addition there was a low interest in the library career field due to low income and the libraries were sorely in need of organization. The libraries had definitely found themselves in a worse situation than before the revolution. Krupskaya held censuses of the libraries and boldly addressed the issues. She encouraged libraries to collaborate and to open their doors to the general public so that all could benefit from their resources. Krupskaya also encouraged librarians to use layman’s terms when speaking with patrons and to speak in jargon everyone could understand, regardless of education. Knowing your readers was encouraged; knowing what kind of books you should have, the subjects readers were interested in, and organizing the materiel in a fashion to better serve the readers. Committees were held to improve card catalogs. Krupskaya stated at a library conference: “We have a laughable number of libraries, and their book stocks are even more inadequate. Their quality is terrible, the majority of the population does not know how to use them and does not even know what a library is.” Krupskaya’s intention was not to scold but to motivate her people to accomplish the large task they had to do. Krupskaya’s influence made a huge change in the Soviet Library systems. Between 1928 and 1933 there was a rise from 58 to 90 percent literacy and even still she pushed for better quality. Few who knew Krupskaya would deny the depth of her passion for her personal causes. She wholly believed that Marxism was the ideal way for a country to be run, but each of her causes were interdependent on each other. Krupskaya saw her work as a step toward improving the life of her people, granting all individuals access to the tools of education and libraries. However, even among revolutionaries, her work in the libraries did not meet with unanimous approval. Famous Russian revolutionary novelist, Maxim Gorky, in a 1922 letter to French author Romain Rolland, who was an enthusiastic support of the Soviet Union and of Joseph Stalin, expressed his doubts about her contribution. "The fact is that Lenin's wife is by nature not a very bright person, suffering from Basedov disease, and is therefore psychologically not very sound. She compiled a list of allegedly counter-revolutionary works and ordered these to be removed from libraries. The old woman considered works of western European philosophers, thinkers, writers as well as Russian as counterrevolutionary. My first thought was to renounce my Soviet citizenship but then, it would not have changed much." Krupskaya is the author of the biography Reminiscences of Lenin, (1926) which chronicles the life of her husband. However, the accuracy of this work has come into question due to her conspicuous omission of certain details about Lenin’s life: the book fails to mention the execution of Tsar Nicholas II of Russia and his family shortly after Lenin’s rise to power, and she omits any reference to the Red Terror. Her biography is the most detailed account of Lenin’s life before coming to power, but it ends in 1918, shortly after the Bolsheviks took power. The asteroid 2071 Nadezhda discovered in 1971 by Soviet astronomer Tamara Mikhailovna Smirnova was named in her honor. ↑ Robert Hatch McNeal. Bride of the Revolution: Krupskaya and Lenin. Gollancz, 1973. ISBN 0472616005), 5-9. ↑ C. Bobrovskaija. Lenin and Krupskaja. (New York City: Workers Library Publishers, Inc., 1940), 4. ↑ Nadezhda Krupskaya spartacus. Retrieved February 19, 2009. ↑ Glossary of People: Kr "Krupskaya, Nadezhda" at marxists.org. Retrieved February 19, 2009. ↑ originally published in Prospects: the quarterly review of comparative education (Paris, UNESCO: International Bureau of Education), XXIV (1/2) (1994): 49-60. (in English) UNESCO Retrieved February 25, 2009. ↑ N. K. Krupskaya, Part two: "Krupskaia on libraries," 45-51. in Primer of Comparative Librarianship, edited by Sylva Simsova. (London: Clive Bingley, 1982. ISBN 9780851573410). ↑ Lutz D. Schmadel. Dictionary of Minor Planet Names, 5th ed. (New York: Springer Verlag, 2003. ISBN 3540002383), 168. . Retrieved February 19, 2009. McNeal, Robert Hatch. Bride of the Revolution: Krupskaya and Lenin. Gollancz, 1973. ISBN 0472616005. Raymond, Boris. The contribution of N. K. Krupskaia to the development of Soviet Russian Librarianship: 1917-1939. Thesis (Ph. D.) University of Chicago, 1978. Schmadel, Lutz D. Dictionary of Minor Planet Names, 5th, New York: Springer Verlag, 168. 2003. ISBN 3540002383. This page was last modified on 6 November 2018, at 00:21.